If you know me and have been following me for a while now, then you no doubt know that Ratchet & Clank just happens to be my favorite PlayStation franchise. So, when I get a chance in my summer vacation to play a game from the series, I jump on it. That's exactly what I did here with this retro review of Ratchet & Clank: Up Your Arsenal (no offense), the third entry in the illustrious franchise. A game that both robots and squishies alike can enjoy. I finally got to play the reboot of the Ratchet & Clank series earlier this month, and it made yearn to play some more of the series. 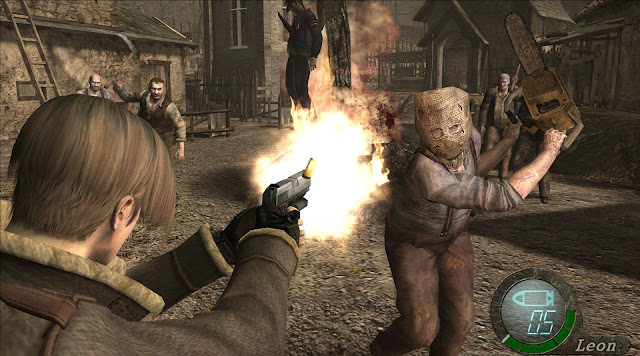 I had already played the PlayStation 2 original games up to Deadlocked, as well as pretty much all of the PS3 entries apart from Full Frontal Assault. Though I own the latter, the negative fan feedback put me off of playing it. Regardless, I started a new file in Ratchet & Clank: Up Your Arsenal a year ago on the PlayStation 3 as part of the Ratchet & Clank Collection. 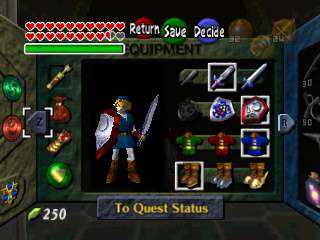 However, other more recent games got in the way of my playthrough. Long story short, playing the Ratchet & Clank reboot got me back to my old Up Your Arsenal save file to enjoy this third ever entry. Ratchet & Clank: Up Your Arsenal follows Ratchet and Clank enjoying what appears to be a game of galactic chess, though instead of kings, queens, rooks, and knights, they have Snargian Snagglebeasts and other in-universe monsters instead. Hearing word that a group of monsters known as the Tyhrranoids, is attacking Ratchet's home planet of Veldin, he and Clank travel across the galaxy to reach Veldin and support the troops, the Galactic Rangers, trying to fend off the Tyhrranoids. 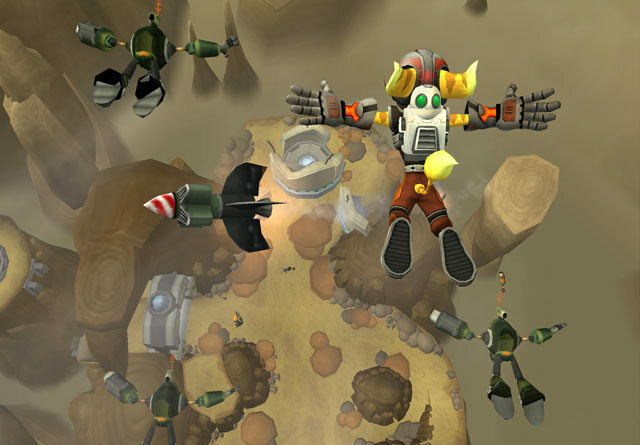 This action starts off a grand galactic adventure, seeing Ratchet and Clank travel to various locales, aiming to stop a villain connected to a certain character's past's grand plan on turning the universe's "squishies", as he calls all organic lifeforms, into robots. 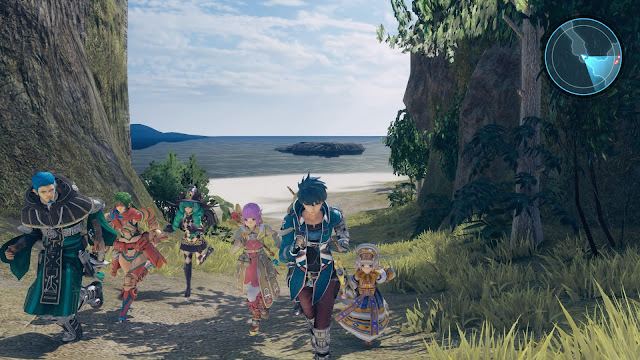 The story is engaging, the story sequences don't interrupt the flow of gameplay too often (these can also be skipped at will with a simple press of the Start button), and the humor of the game continues the series's fine line of funniness. Compared to its predecessor, Going Commando, Ratchet & Clank: Up Your Arsenal plays very similarly. 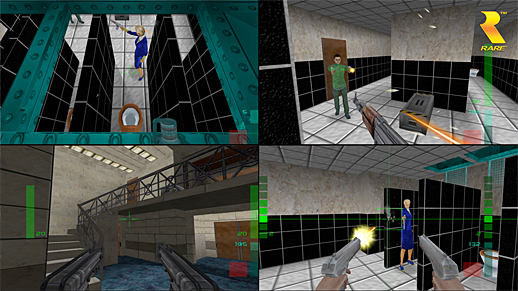 The game is a 3D platformer with third-person shooting elements, though the latter is more prevalent and focused on than in Going Commando. Regardless, there's still a good amount of careful precision jumping on various platforms to be found here. Ratchet and Clank have a grand adventure ahead of them in Up Your Arsenal. The new additions to the gameplay of Up Your Arsenal include Galactic Ranger missions that are all focused on combat scenarios. You team up with a gang of AI robots to complete a certain objective. Most simply have you eliminating all enemies on the battleground, whether as Ratchet himself or him inside a combat spaceship, while other missions have you protecting a batch of Galactic Rangers as they fix a turret. The latter is far from an annoying protection mission, as it's quite simple, so no worries! Regardless, these more action-oriented scenes make for some nice pacing and freshness to the game. There are also five video game cartridges that tell the adventures of Captain Qwark through a charming 2D side-scrolling platformer that is a lot of fun to play as well. Geronimo! 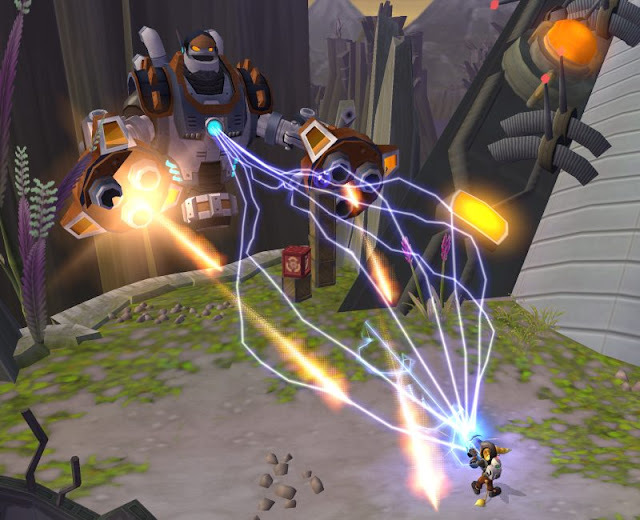 Ratchet and the Galactic Rangers get a drop on the enemy forces in some missions. Continuing with the action focus, there is also a battle arena, a coliseum, if you will, for Ratchet and Clank to face challenges in, known as Annihilation Nation. 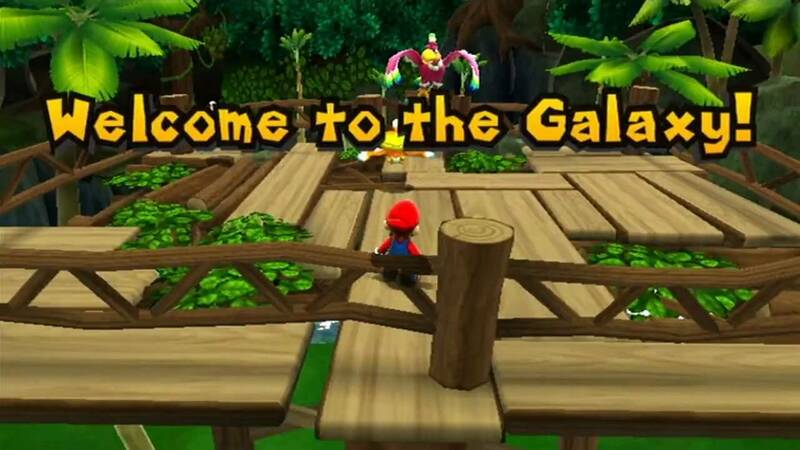 Here, special themed arena contests are held, with the rewards being vast amounts of bolts. Some contests need you to clear multiple round of enemies while dodging environmental hazards like spinning blades and fiery pits. Others give you a boss to tackle, force you to fight without taking damage, or have you using just one weapon to survive. These are enjoyable challenges to do, and yes, they further add to the value of Up Your Arsenal. 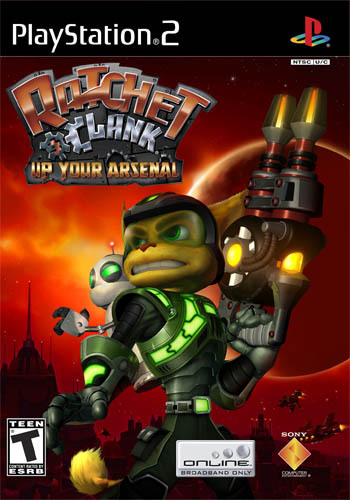 During the game, Ratchet and Clank will also sometimes split up, as they did in both the original R&C and Going Commando. Clank will have segments where he teams up with a monkey to get through hazard-laden areas. With Clank's banana gun, Clank can fire bananas as a means to get the monkey to certain spots, such as on a button to extend a bridge or in a spotlight that triggers a turret gun that would otherwise kill Clank instantly, but instead, the monkey distracts the turret so Clank can pass by. (No monkey was harmed in the playing of this game.) 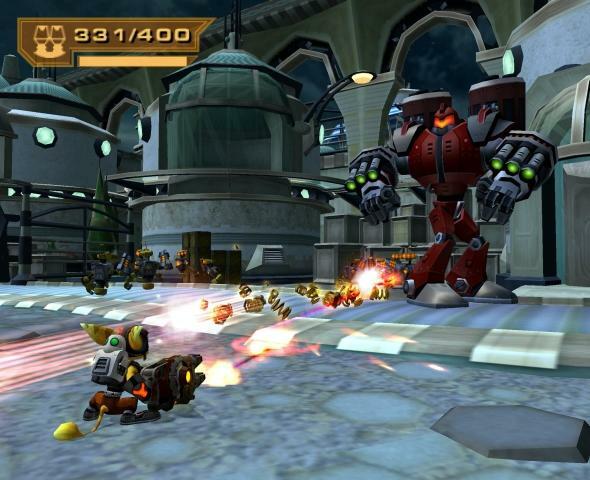 There are also times where Clank can control up to four miniature helper robots, tasking them with following, staying put, attacking foes, or entering little houses that when all the robots have gone inside, the way for Clank to proceed opens up. Ratchet also has some fun by himself. 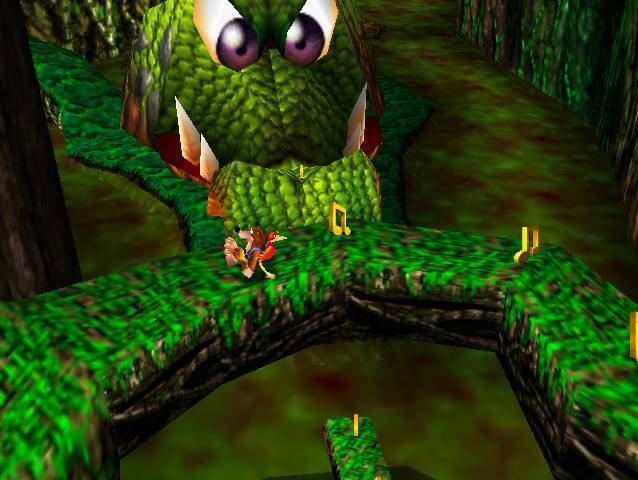 In one portion of the game, he dons a Tyhrranoid outfit to sneak into the main villain's aquatic base, interacting with real Tyhrranoids through burping, odd movements, and belching. This is done with a Parappa the Rapper-style rhythm mini-game that doesn't outwear its welcome as it's used sparing, and adds to Up Your Arsenal's variety. 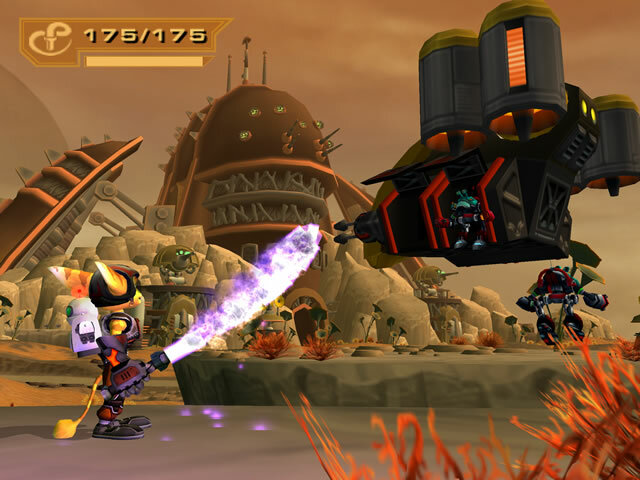 The Tyhrranoid outfit, or guise, is one of many gadgets that Ratchet and Clank come across in their planetary adventure. 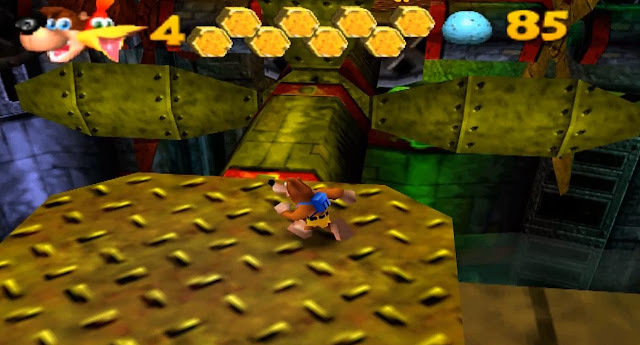 Another like the Hypershot, serves as a a gadget that can be used to cross chasms by linking to a hook-like contraption, and allowing Ratchet to sling across. Then there is the Hacker, which allows the opening of locked doors through playing a simple mini-game where you shoot around a circular field, blasting red lasers while tractor-beaming up green lasers to pass. Finally, things like the Gravity Boots that grant Ratchet the ability to walk up certain pieces of the environment, and the Refractor that reflects lasers to solve environmental puzzles, round out the gadget package in Up Your Arsenal. and the Galactic Rangers bring the fight straight to the enemy. 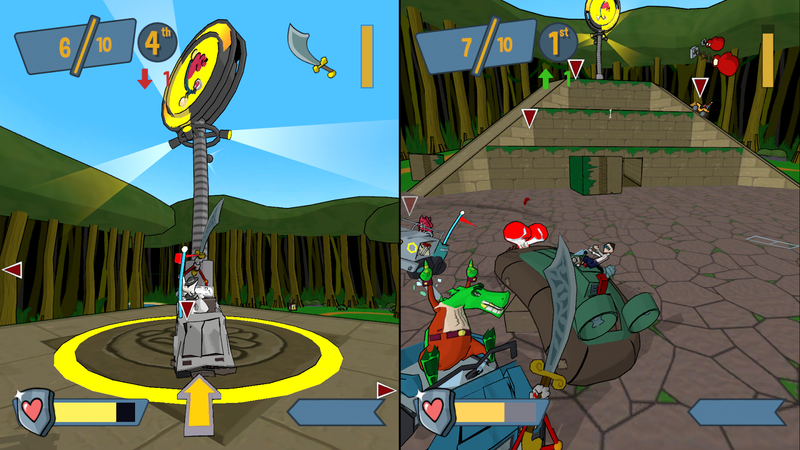 As Ratchet moves through levels, he can use either his standard melee weapon, a large wrench, or he can utilize a wide repertoire of high-powered weaponry, most of which is earned by buying them from vending stations placed throughout levels in the game with the Bolts (the currency of the Ratchet & Clank series) found from broken boxes and defeated enemies. 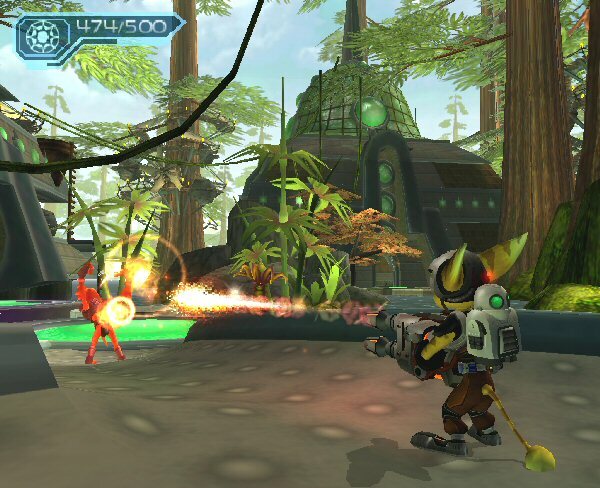 The first main planet Ratchet and Clank get to explore is the jungle planet of Florana. Like Going Commando, through consistent use of a given weapon (and that weapon's shots must hit an enemy), guns and weapons gain experience, leveling up to grow stronger. 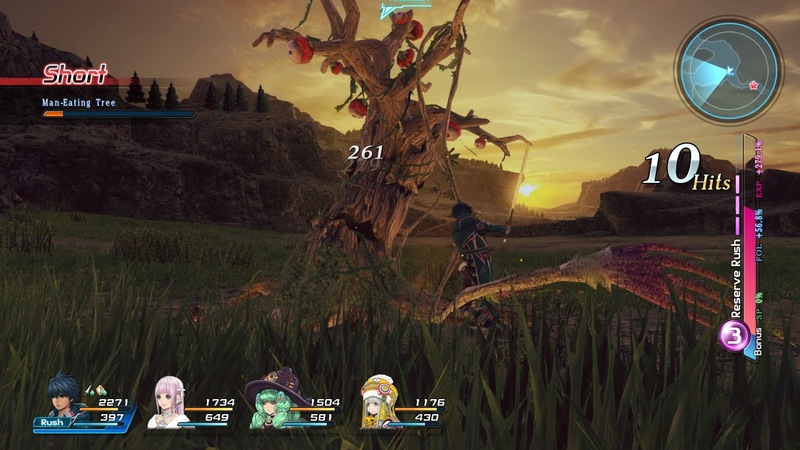 Weapons can be leveled up initially up to four times, resulting in a version five of a given weapon. The Ratchet & Clank series is known for its wide array of clever and fun-to-use weapons, and Up Your Arsenal certainly is no different. Blasters, missile launchers, plasma whips, sniper rifles, laser shields, acid-spewing guns that infect enemies and confuse them into attacking their own side, and so much more are available for Ratchet to use throughout the game. As weapons level up, something like the portable death machines known as the Agents of Doom, that fight beside Ratchet in battle, in their fifth level, turn from four marching robots that fire weak lasers into hovering death bots, launching missiles at foes. Once some guns get leveled up enough, they can become positively shocking! When the initial game is beaten and the final boss has been made to eat Ratchet's dust, a new Challenge mode is available for players. Here, weapons that have been fully leveled up in the original campaign can have stronger version purchased from a Gadgetron vendor. These can then be leveled up a couple of more levels, becoming totally powerful in combat. In addition to that, a new bolt multiplier is available, increasing as Ratchet defeats enemies without taking damage, up to a 20 time bolt multiplier. Big or small, Ratchet and Clank take out them all! Bonus content in the form of well hidden Titanium Bolts, which can be used to buy character skins such as a tuxedo-wearing Ratchet, a ninja-guised lombax, or even a frosty snowman, is here. 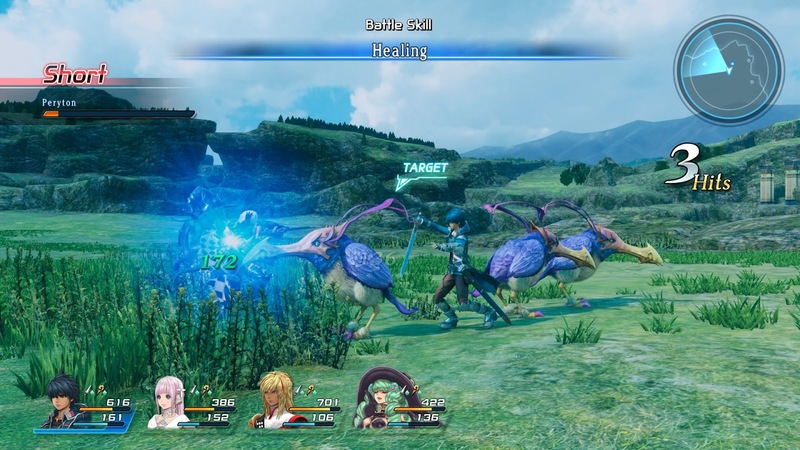 Additionally, the series's usual skill points return. There are 30 in all, and these are essentially special tasks to do in levels that you wouldn't normally think of doing, such as shooting down innocent flying Pteradactyl on one planet, or defeating a boss with only Ratchet's wrench. 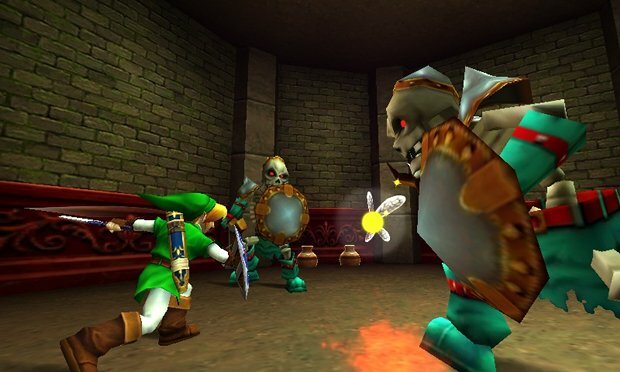 These unlock fun cheats like a big head mode or mirroring the levels of the game completely. Ratchet & Clank: Up Your Arsenal doesn't shake up the established formula of the series too much, but instead it further refines it. 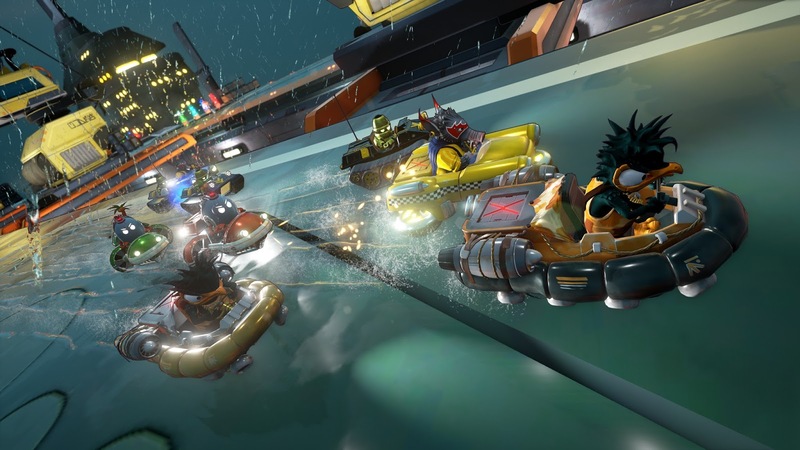 Ratchet controls as tightly as ever, new weapons add new strategies to battle, the platforming is more finely honed, and additionally gameplay like Galactic Ranger missions, Qwark side-scrolling levels, and Clank solo sections add some variety. Some might not care for the more action-focused gameplay when compared to the previous two Ratchet & Clank games, but all in all, Up Your Arsenal delivers good variety, a great villain, and the same gameplay that makes so many of us return to the Ratchet & Clank series time and time again. Continuing the review output for the month of August is Obliteracers, a fresh take on a familiar formula. How does she handle? Let's find out with this SuperPhillip Central review. Opponents obliterating each other as well as my overall fun. In a genre so full of me-toos and derivative games, it's nice to see Varkian Empire's Obliteracers try something new with their action racing. That said, Obliteracers is sort of a misnomer for the name of the game. 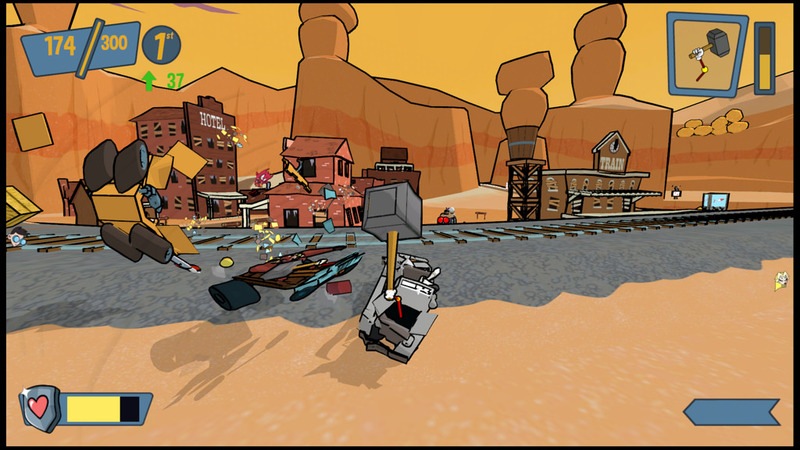 The central mechanic of Obliteracers is all about destroying the other cars while driving along one of a handful of twisty tracks such as a sky high mining metropolis, a minefield in a desert, and a tropical coast. There are no laps, there are no finish lines, and there really isn't a reason to be in first place except for one mode. 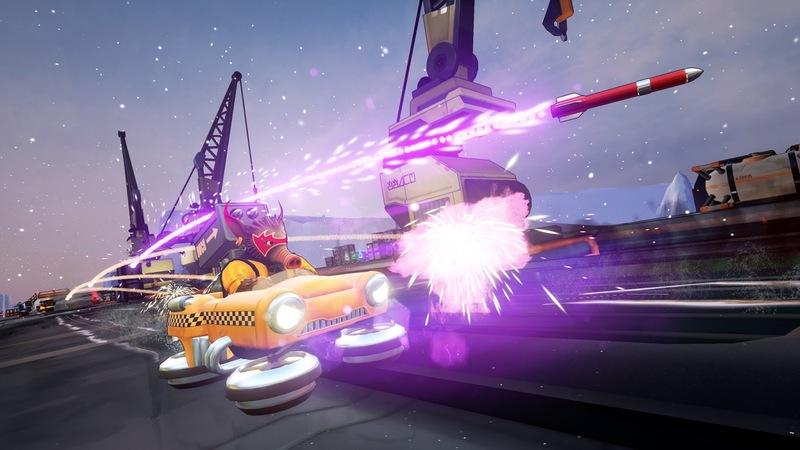 The weapons offered by Obliteracers run your standard gamut of explosive goodness-- machine guns, rockets, mines, shockwaves, a trail of slippery oil to let loose behind your vehicle, and even a series of flames that burn from the sides of your ride. All of these are used to blow up, annihilate, and destroy the other opponents who dare share the same track as you. This weapon launches three pink missiles at opponents unfortunate enough to be in your path. What also makes Obliteracers stand out other than being all about destruction rather than pure racing is that the game has a fixed camera that is centered on the leader of the pack of cars. 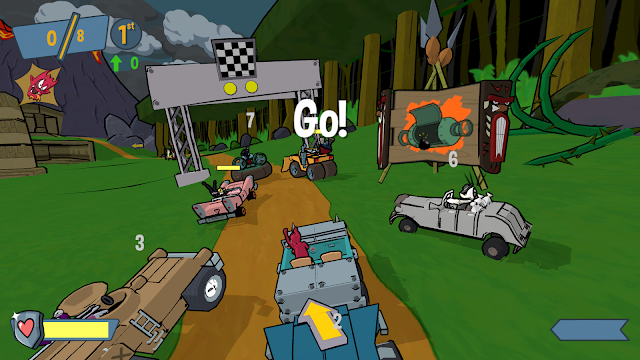 Thus, every player is shown on the screen at the same time, and if you don't keep up and go off screen, you car gets obliterated. While this is generally fine with just four vehicles on screen at the same time, it is especially and painfully clear in events with eight or more vehicles that this doesn't work so well. Like, at all. 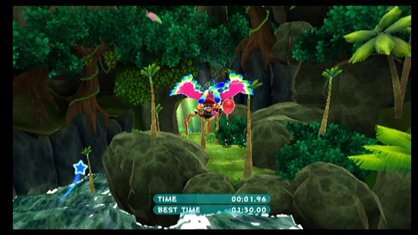 You see, there is very little real estate on the screen for eight or more racers, In these more crowded races, the area upon which you're considered too far behind, thus being knocked out is larger. In addition to that, most of the time if you're leading the pack, the camera angle forces you to make blind turns or worse, blind jumps, usually leading to you falling off the track. Things can get quite crowded with eight opponents at once. The main campaign of Obliteracers features several dozen events focusing around four types. Survival has you trying to outlive the other vehicles on the track. Doing so gives you a point. Earn a set amount of points before your opponents to win. Knockout and Endurance are similar. Knockout earns you points for defeating opponents, though if your car is destroyed, you have to wait until the next round to come back. Meanwhile, Endurance forgoes rounds, having you instantly return to the action if you are destroyed. Finally, Leader mode gives points for any kill to the player in first place. Doing well in these campaign events earns you bombs. The more you collect, the more events you unlock. In the initial few races I felt in control of my own destiny. To put it in less dramatic terms, when I won, I felt like I earned it. When I lost, it was because I screwed up. Later events with eight or more racers are basically crap shoots. 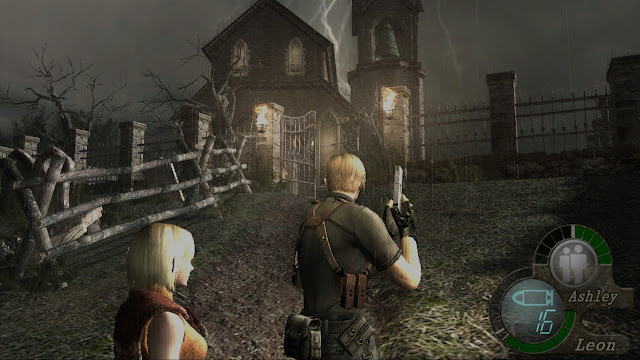 In a game of Survival, it never seemed prudent to take the lead, as you'd just have a bunch of weapon-toting opponents on your tail, ready to fire at you. Being in the back was safer, but it still wasn't a safe bet. It seemed like I would win a round randomly when things finally fell correctly into place out of pure happenstance. And things just become too chaotic with 12 opponents on screen at once. Then there's this event-- a 12 racer Endurance event that totally made me just flabbergasted at how it passed testing and QA. 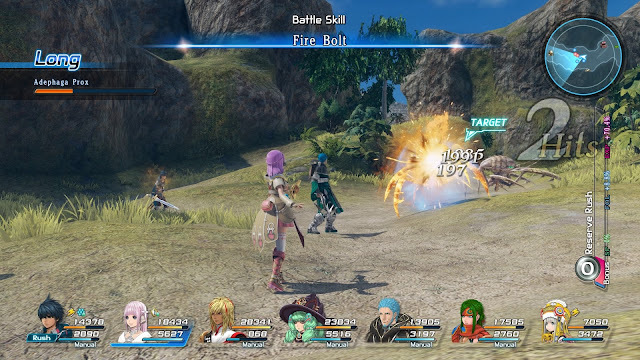 As stated earlier, an event with eight or more opponents makes for a crowded screen. 12 opponents that can constantly re-spawn into the race? Even worse. If you get destroyed, your car is but one of 12 that zooms into the picture, making it very difficult to even see when you drive back into view. And not only does the camera not actually follow the leader but instead the middle of the pack (leading you to have to negotiate a turn at a weird angle due to this, oftentimes resulting in you falling off the track or going off course), but as cars bump into and jostle one another, getting off course is commonplace. This race usually had up to 10 cars fall off at one turn. Additionally, you can forget about picking up weapons or being able to feel like you have any control in this race. It's pure rage-inducing, and it's amazing that the developers felt that the game could work with so many racers on screen at one time. It can't. So, as a solo game, Obliteracers isn't too compelling. In fact, it can be darn frustrating, and maddeningly so. However, with friends, Obliteracers is a rip-roaring good time. Being able to share the same screen and enjoy some local multiplayer fun is indeed entertaining. Online is also available, but it's pretty hard to find and join a game. 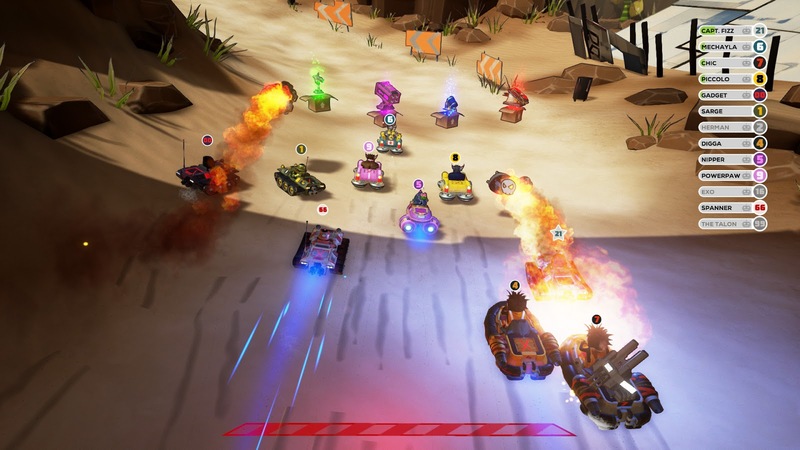 Thus, Obliteracers is almost forced to be a local multiplayer-only game due to the lack of players online. Thus, Obliteracers is a tough sell overall. 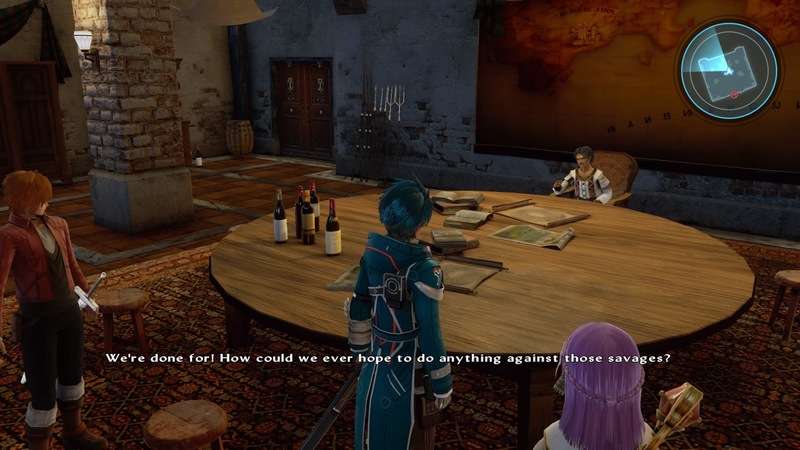 The main campaign struggles to hold one's attention for long with its pithy amount of event types, almost entirely luck-based and borderline broken events in later offerings, and short longevity. The online servers also don't have too many players either. 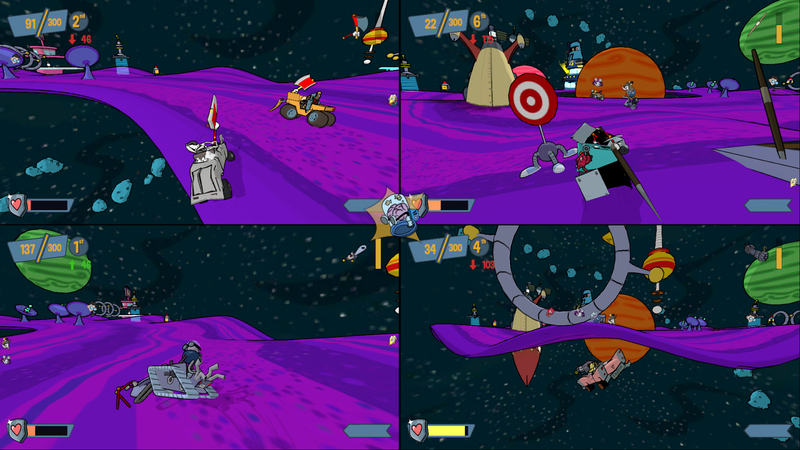 However, if you have friends locally to play with, then Obliteracers can give you a few game nights of wacky entertainment. Just don't take the gameplay as anything but severely flawed fun. 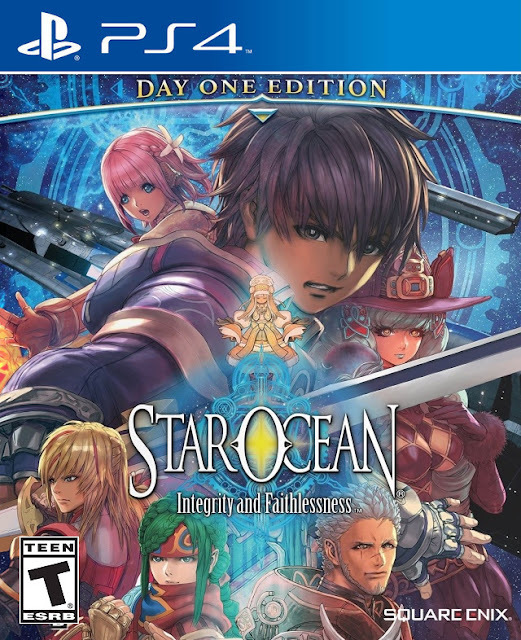 Review copy provided by Deck 13 Games. SuperPhillip Central's Favorite VGMs is here to cap off your Monday evening right with a collection five fantastic video game tunes. With us being right in the middle of the Olympics, it only makes sense to have at least one VGM volume dedicated to the event. 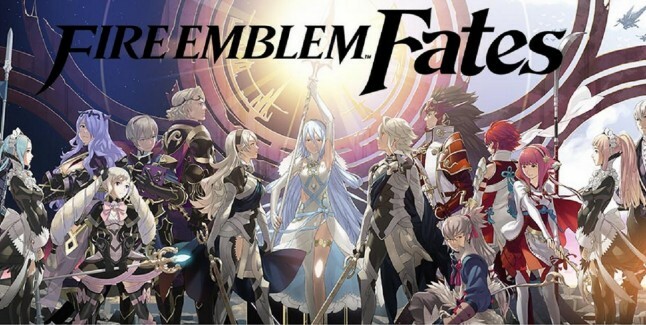 First, however, we kick things off with a battle theme from Fire Emblem Fates. THEN, we dive into the Olympics with Mario & Sonic at the Rio 2016 Olympic Games. 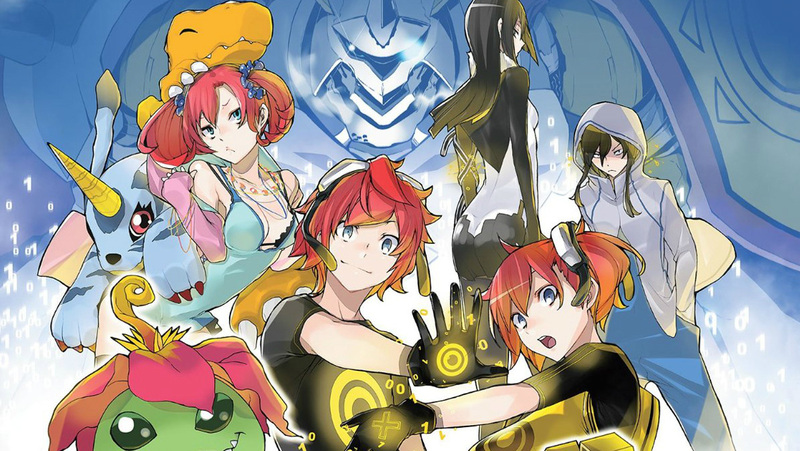 Super Monkey Ball 2 delivers a chill tune, followed by Digimon Story: Cyber Sleuth offering a dungeon theme. Finally, Kingdom Hearts HD 2.5 ReMIX concludes this Olympic Gold edition of the Favorite VGMs. 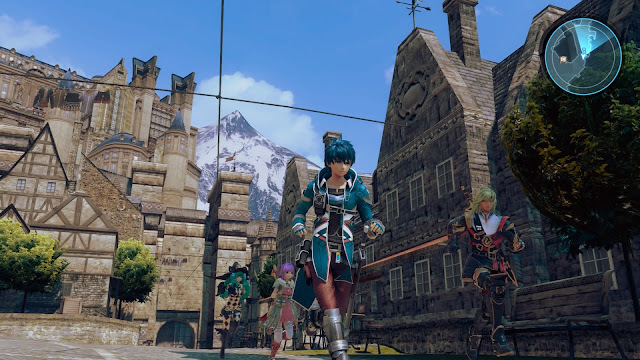 Kicking off this week's edition of SuperPhillip Central's Favorite VGMs in high gear is a battlefield theme from Fire Emblem Fates, another great entry in the Fire Emblem series. This earlier-in-the-year release came in three versions. I'm still knee deep in Birthright, but there was also Conquest and Revelation. Regardless of which version you pick, you're bound for an enjoyable game with an absolutely astounding soundtrack. 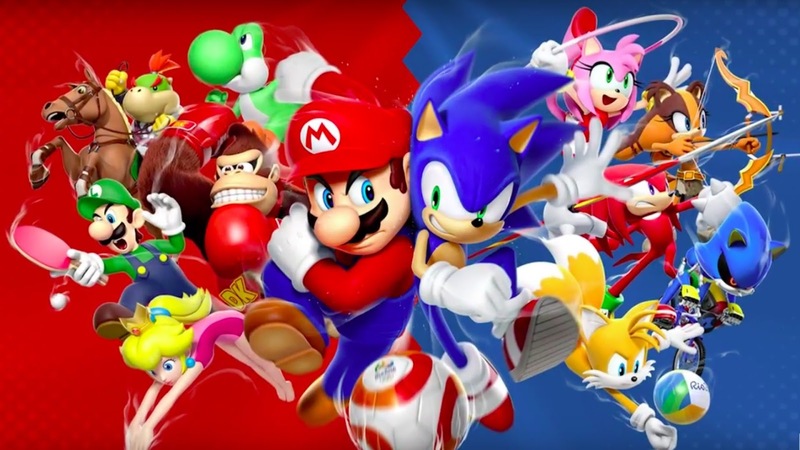 Coming from the latest in Mario and Sonic the Hedgehog's Olympic rivalry, this version of the football theme has the crowd providing vocals during a tense game of the footie. Even if things don't go your way on the field, you can take pride that you did your best with no regrets. Take THAT, Hope Solo! Let's go from some action-packed themes to something much more chill and relaxing. 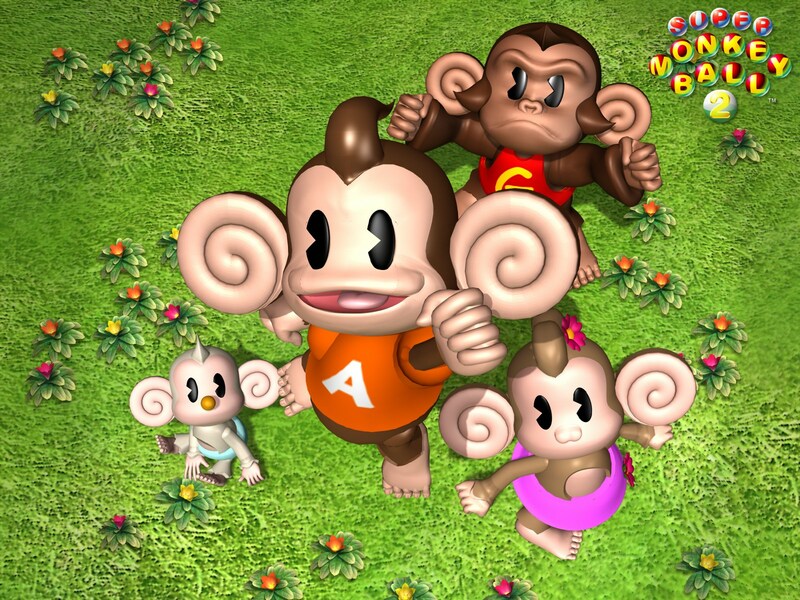 It's the mini-game theme of Monkey Target, making its second appearance in a Super Monkey Ball game. The warm electric guitar synth ostinato that covers the entire track forms a stellar harmony with the main melody. It's a perfect song to unwind after cursing out the incredibly stressful main campaign. 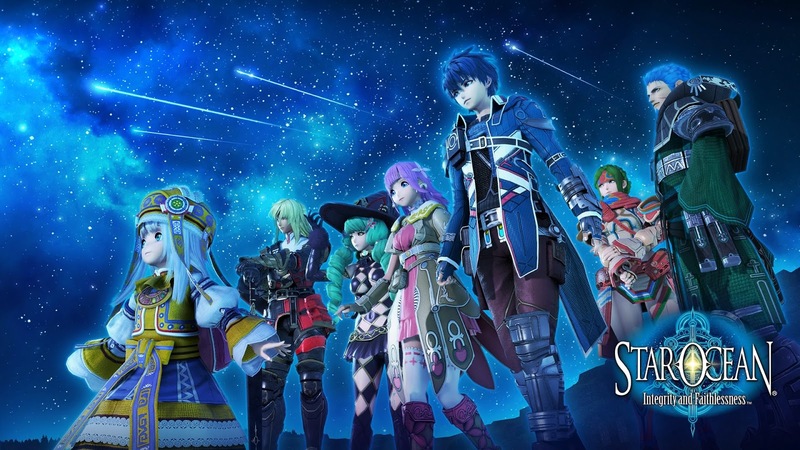 Another release from this year (Fire Emblem Fates and Mario & Sonic being the others), Digimon Story: Cyber Sleuth offers over 100 hours of gameplay to those who clamor for it. The RPG action is mighty tempting to do just that. Then, you have the wonderful soundtrack to go along with it, such as this theme for the final dungeon in the game. The somber and melancholy theme of Roxas from Kingdom Hearts II and its up-port on the PlayStation 3 is what rounds out this week's video game music picks. Yoko Shimomura pulls at the heartstrings with her flute and piano composition. A truly marvelous theme.